On June 14, 1943, Sub-Lieutenant Douglas Hamilton Morgan, (Royal Naval Volunteer Reserve) crashed on take-off at Quonset Point Naval Air Station. The impact detonated a bomb the plane was carrying, fragments of which injured twenty-three men in the immediate area, but only three of them seriously. Morgan initially survived the crash, but died the following day. He was born in Edinburgh, Scotland, November 11, 1923, and was 19-years-old at the time of his death. He was commissioned a midshipman in the R.N.V.R in 1942. It was reported that Morgan was flying a single-seat aircraft, but the type was not specified. (Possibly a Corsair) A newspaper account published June 17th mentioned another R.N.V.R. pilot was also killed on June 14 in an air crash in Rhode Island, but no specifics were given. That pilot was identified as Lieutenant Anthony Max Leslie Harris, 20, R.N.V.R., of Surrey, England. Update 1: It has since been learned that Lt. Harris was killed when his Corsair I crashed behind a church in Tiverton, Rhode Island, on June 14, 1943. 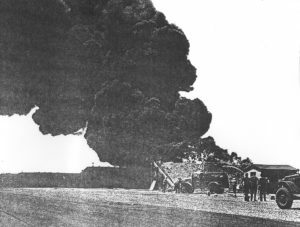 There is information to suggest that Sub-Lieutenant Morgan’s aircraft crashed into a bomb bunker setting off a series of explosions which might explain the high number of casualties connected to this incident. The aircraft piloted by Sub-Lieutenant Morgan was a Corsair I, on loan to the British. Both Lt. Harris and Sub-Lieutenant Morgan are buried in Island Cemetery in Newport, Rhode Island.